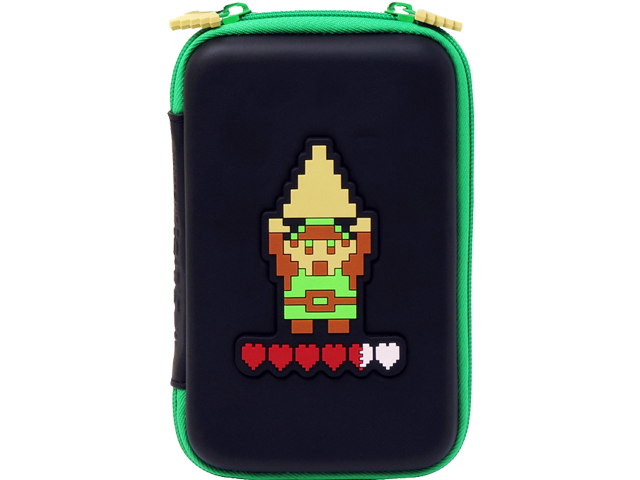 Let Link™ help protect your New Nintendo 3DS XL™ or Nintendo 3DS™ XL from scratches and wear with this officially licensed Hard Pouch. With its built in storage for up to six Nintendo 3DS game cards and rubberized zippers, this Retro Link Hard Pouch is perfect for protecting your New Nintendo 3DS XL or Nintendo 3DS XL on the road or at home. Pouch can be used with New Nintendo 3DS XL, Nintendo 3DS XL, Nintendo 3DS, Nintendo DSi XL™, or Nintendo DSi™ systems. *Nintendo 3DS XL and games not included.